In two earlier posts I have written about my favourite walking ground, Bukit Kiara. 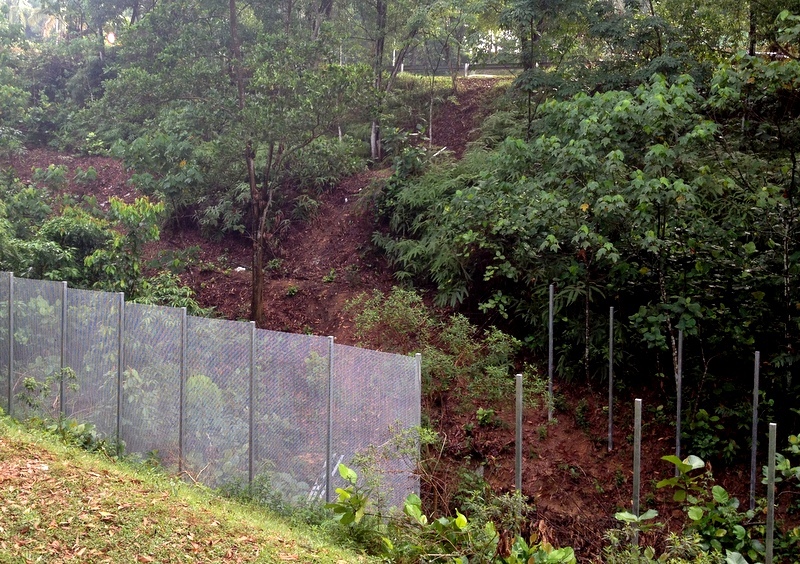 About the ugly and useless fence that has been erected by DBKL/JLN this year. About the protests, organised by the Friends of Bukit Kiara and other groups, resulting in a stop-work order by the Ministry. Probably too late as much damage has been done already. My album The Great Wall of Kiara gives a detailed report. Here is a Google Earth map from this report. 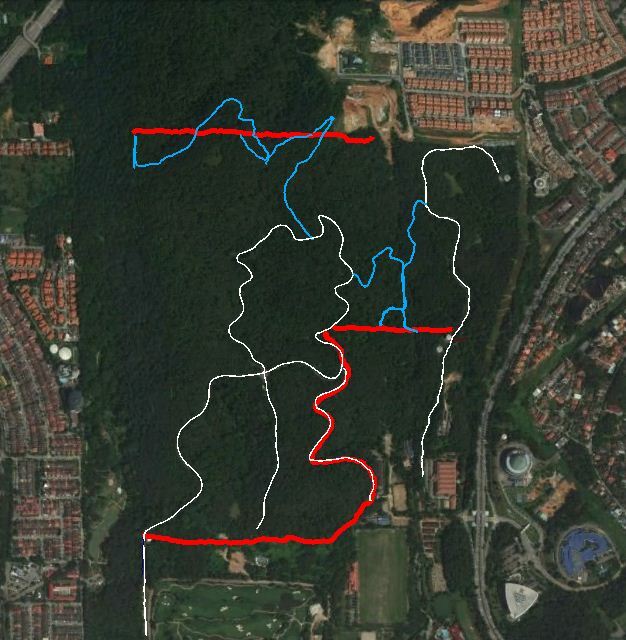 The existing (tar) roads in white, the fence in red, and in blue the recently constructed or widened roads. The red lines are a bit wiggly, because they are the result of my attempts to follow the fence as closely as possible. Not always easy, but fun. Compare this with an (official?) 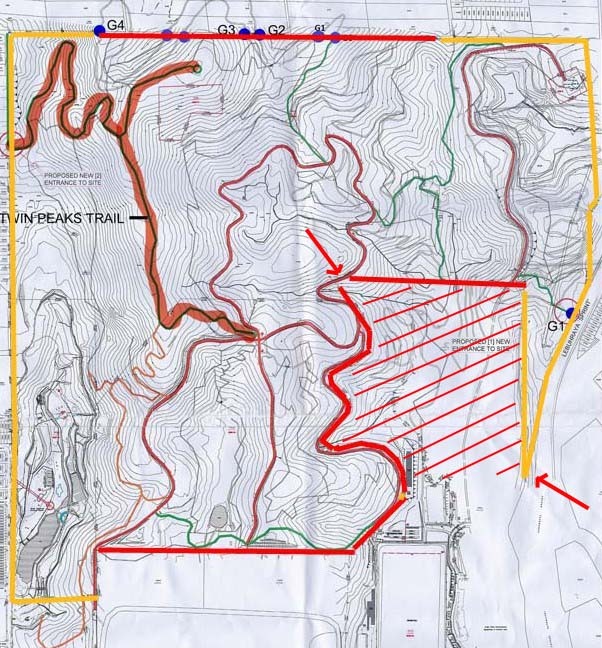 map where I have marked the same parts of the fence in red, and the missing/unfinished parts in orange. The red and yellow lines basically enclose the future Bukit Kiara Park. The shaded area is the bone of contention, claimed by Berjaya for development. Note the two red arrows. The left arrow points to a gap in the fence, not more than 30 meter wide. Why? Here is a possible explanation. 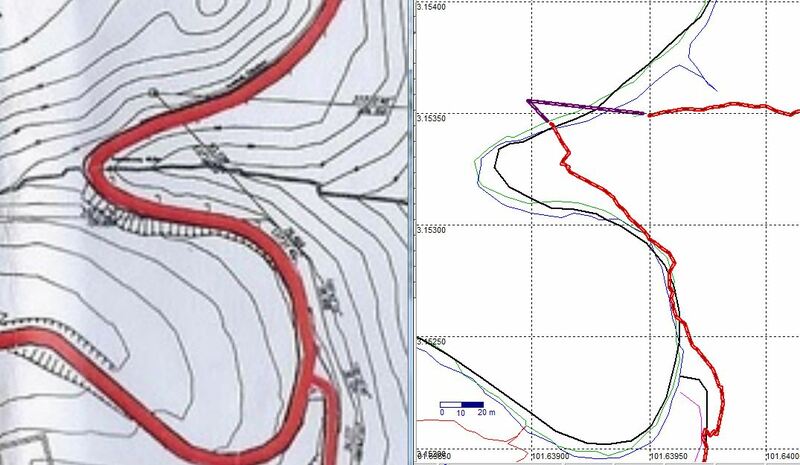 The image below shows an enlarged region of the map above, with my GPS-tracks next to it. 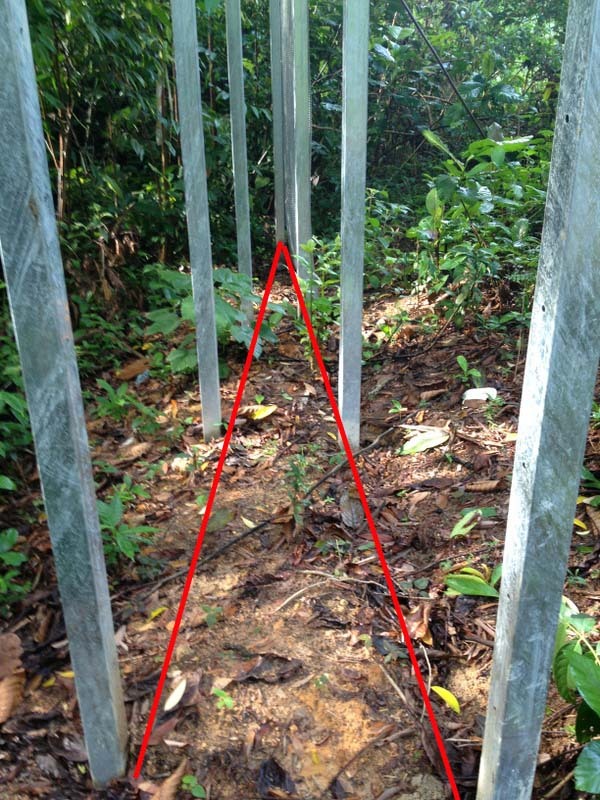 The thin straight lines mark the location of the proposed fence. As you see, by mistake or planned, those lines intersect at the other side of the tar road! The second arrow points to a part of the fence which I had not yet explored. Would they really have built the fence this way, first going south, then turning almost 180 degrees and going north again? Enclosing a part of Kiara, at the end less than one meter wide? Hard to believe. I could not believe my eyes, when I saw that, YES, they were planning to follow the lines on the map! The poles are already there. I was laughing out loud, all alone in the jungle! Here is where the two parts of the fences are supposed to meet.To guide the eye, I have connected the poles with red lines. When they would have continued the job, would they have been able to fix the actual fencing to the poles, near the end? I have serious doubts. Where I was standing to take the picture, there is still some space between the two sides. But near the end, there is none.